As summertime kicks into full gear, it marks the migration from the kitchen to the grill. Who wants to heat up the house with a hot stove! 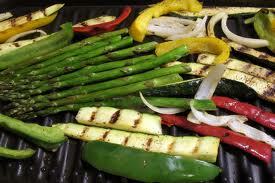 One of my favorite things to do on the grill is fresh vegetables. Now that many are coming into season it’s time for making the most of them on the grill! I got quite a few zucchini in my last two CSA shares and there is nothing better than slicing them on the diagonally into thick pieces, rubbing them with some olive oil, and throwing them on the grill. My other favorites are bell peppers, eggplant, asparagus, onions, mushrooms and even tomatoes. Once I cut them into grill ready pieces, I take a sheet or two of paper towel and my favorite olive oil and rub them all down. Not too much olive oil mind you, you don’t want flare ups. But enough to get grill marks and add that delish flavor (plus it keeps them from sticking to the grill!). I grill them to the color and texture I like then remove them from the grill into a bowl. I add salt and pepper and – balsamic vinegar to them. It couldn’t taste better! I sometimes add a little more olive oil and if I’m feeling really crazy, I sprinkle them with fresh ground parmesan cheese. Oh la la la la as they say in Paris. Tres magnifique!!! These veggies make the perfect side dish for any meal. The rainbow of colors and the flavors create a visually exciting dish that people can’t wait to eat. And the pieces are big enough that if there is a particular vegetable that someone doesn’t like, they can pick around it. Another great example is simple is delicious! AND the fresher the vegetables the better. When using few ingredients, use the best you can find. It makes a huge difference! I can’t wait for corn to come into season!! !